Designing your cheap fall wedding centerpieces makes you think about the stunning colors that this season brings, the golds, oranges, deep reds and chocolate browns. 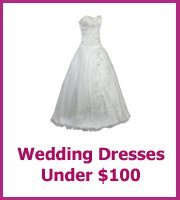 The colors are luxurious by themself and also gorgeous and this makes creating your cheap centerpieces so much easier. A traditional look is created with candles, they are a great center to a fall wedding, especially as it gets dark much earlier. 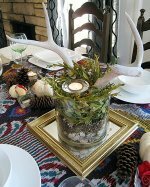 Buy some cheap pillar candles and place them on a platter or plate and then surround them with pine cones, add your wedding color with the plate or by adding flowers to the centerpiece. 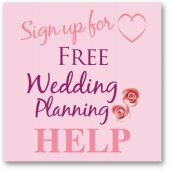 Halloween is also in fall and I know that some of you will be thinking of having a Halloween theme for your wedding decorations. Rather than a traditional Jack O'Lantern how about carving your initials into each pumpkin for the tables, or you could have the table number carved instead. Mini gourds are also a big part of the Fall season and you could have a bowl of them in the middle of the table or in a row along the middle of the table. 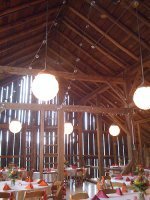 One wedding had tied ribbons to each mini gourd and another had turned them into tealight holders. Fruit and vegetables are realatively cheap when you buy them in season and they look great in a fall wedding, as this often ties in with harvest and thanksgiving time. 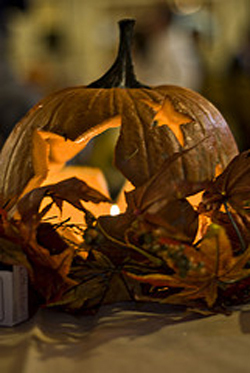 Look for pumpkins, squash, gourds and also oranges for the color and smell. 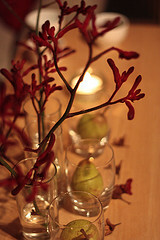 These you could arrange on a platter or in the center of the table and add a sparkle with glass votives round the edge. Berries are also plentiful in fall, fill a hurricane lamp or glass vase with redcurrants or cranberries as they are more robust, then fill with water and add a floating candle to the top. Fruits that fit with the fall season are apples and pears. You could have a minimal modern centerpiece with these along the middle of the table and have glass votives between them for the evening. 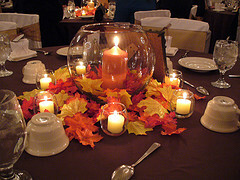 Also think about adding fall colored flowers to your table decorations to add more color and height to the centerpiece. Fall colored flowers in oranges, dark yellows and deep reds look stunning. Flowers that will be fairly inexpensive at this time of year will be chrysanthemums, roses, and gerbera daisies. Keep your flower costs down by having one or two flowers in a bud vase or a glass bottle.